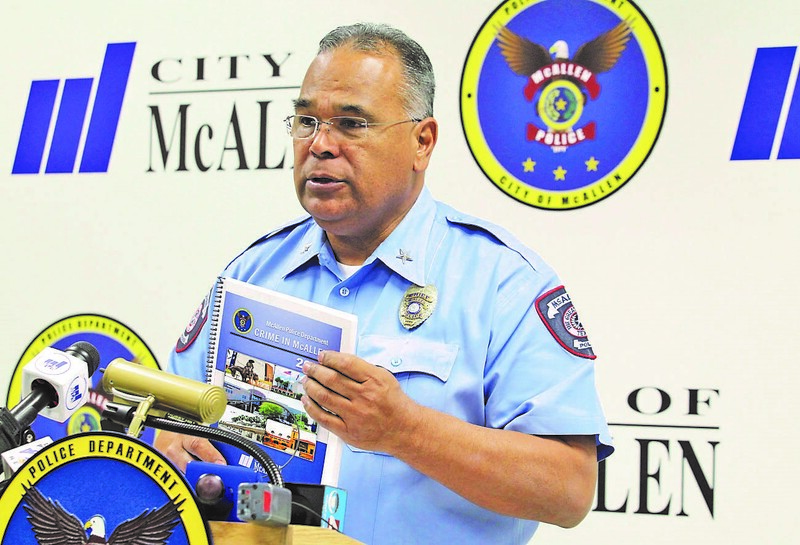 McALLEN — The city announced on Friday that 2018 saw the lowest crime rate in 34 years, just as President Donald Trump has recently called the current state of the southwest border a national security crisis. There were no homicides in McAllen last year. There was the fewest number of robberies and aggravated assaults on record. Police Chief Victor Rodriguez called it an “outstanding accomplishment” that while population has increased in McAllen, crime has not. Violent crime — murders, rapes, robberies, aggravated assaults — decreased by 41 percent from 2017 to 2018, according to the police department’s uniform crime report released on Friday, the only report of its kind issued by any law enforcement agency in Hidalgo County. Three of the four violent crimes dropped; rapes increased by 44 percent, according to the data. Property crimes — burglary, theft, motor vehicle theft — decreased by 4 percent from 2017 to 2018. While, public safety has been the top priority for the mayor and city commission, Rodriguez said, questions keep coming about safety in McAllen and South Texas border communities. He’s been getting the similar border safety questions throughout his 18 years as chief, but the current conversation in Washington has centered on funding a border wall between United States and Mexico, and the country has been transfixed on the security of the border. Rodriguez has been getting more questions recently. “That’s probably the most difficult conversation I have because of the span of time people will listen to you and actually dedicate to try to recognize this,” Rodriguez said at a news conference at police headquarters on Friday when asked about the safety of border communities. Rodriguez has had news media and officials visit from multiple continents over the years — most recently from France on Thursday — to ask about the “phenomenon” that is the U.S.-Mexico border. Rodriguez noted that the confluence of state and federal law enforcement on the border helps the city’s safety. That was perhaps most notable in 2018 when seven masked men with weapons attempted to rob Deutsch & Deutsch jewelry store at La Plaza Mall in July. U.S. Border Patrol, Immigration and Customs Enforcement, Homeland Security Investigations, FBI, Texas Department of Public Safety and other state and federal agencies were all on the scene. There were no injuries and no shots fired.